-Burgess Meredith’s weekly closing narration, on Korg 70,000 BC. Korg 70,000 BC (1974), is a Saturday morning live-action adventure/fantasy series from Hanna-Barbera. The program was created by the late Fred Freiberger (1915 – 2003), a controversial producer who toiled on such TV series as Star Trek (1966 – 1969), Space: 1999 (1975 – 1977), The Six Million Dollar Man (1974 – 1978), and The Wild, Wild West (1966). Korg 70,000 BC ran for just one season on ABC forty years ago. 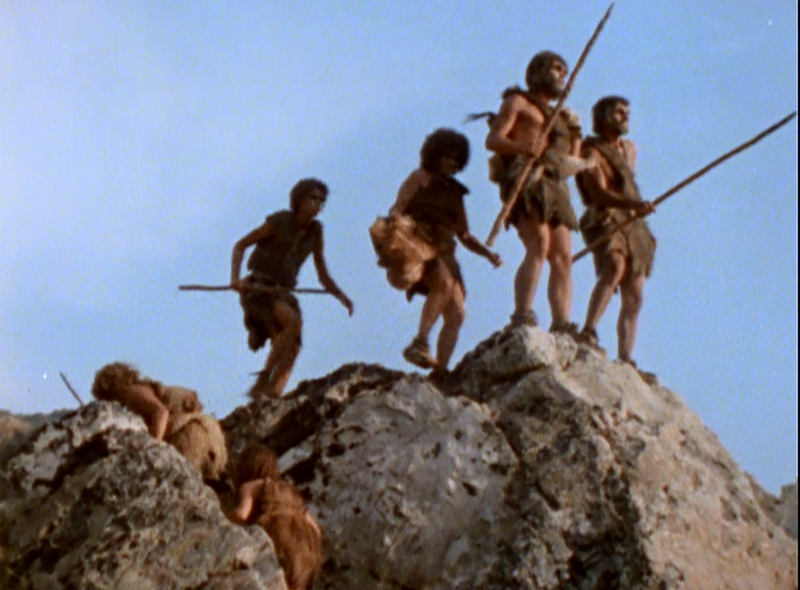 The series follows the adventures of a Neanderthal family headed by the “great hunter” Korg (Jim Malinda). The others in his tribe included his wife, Mara (Naomi Pollack), the hunter Bok, who is also Korg’s brother (Bill Ewing), daughter Ree (Janelle Pransky) and sons Tane (Christopher Man) and Tor (Charles Morteo). Korg ran from September 7, 1974 to late August 1975 and each episode of this half-hour series usually features a relatively simple story, and one that concerns family values. Specifically, the stories are about people helping each other in a dangerous, sometimes incomprehensible world. In terms of the series primary characters, we understand today that Neanderthals are a subspecies of homo sapiens who died out roughly 40,000 years ago. There seem to be two competing schools of thought about their extinction. Either the Neanderthal died because of climate change -- a cold snap in ancient Europe that they couldn’t survive -- or they inter-married with humans and were absorbed into the populace. Today we also know that the pop culture image of Neanderthals as knuckle-dragging, hairy brutes is most likely inaccurate. Neanderthals actually possessed a large cranial capacity (their brains were bigger than ours are…) and they were likely no more hairy than human beings. Neanderthals may have also possessed better eyesight and a more robust physical build than early humans did. Certainly, we know they built advanced tools (including boats), and weren’t strictly carnivorous, as originally believed. On Korg, the Neanderthal family speaks perfect English, which is a little disconcerting at first, and though they have those stereotypical sloping foreheads, are nonetheless depicted as intelligent and caring, if not knowledgeable in a modern sense of that word. In the first episode of the series, “Trapped,” we meet the Korg family near its home cave, and our narrator Meredith describes the hunt for food as a “constant” in its life. Meanwhile, the Korg children play with a stick and discover the concept of the lever in short order. Almost immediately thereafter, an earthquake occurs, trapping the adults inside the cave with no escape route. Directed by Irving Moore, “Trapped” is a not-terribly scintillating introduction to the series. Later episodes are better. 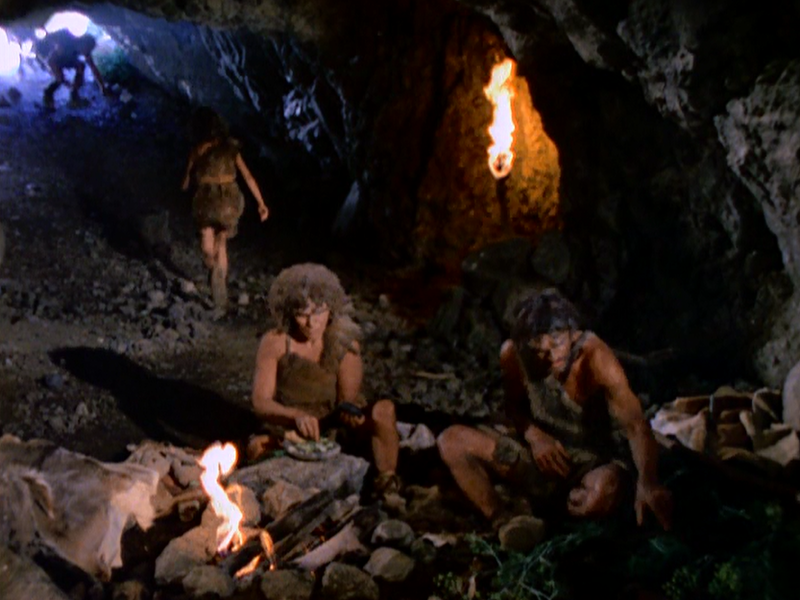 But much of the screen-time here involves Korg, Mara, Bok and Tane navigating an unstable ledge on the cave’s interior. Yet because of production limitations, the ledge doesn’t seem particularly dangerous. Indeed, the group has to cross it a second time, and does so without incident (or even mention). Also, the writing in “Trapped” smacks of contrivances. Ree and Tor discover how to use a lever (or see-saw) just minutes before that very tool will prove necessary to save their parents and sibling. Of course, this is how TV (and particularly kid’s TV of the 1970s…) works, but still, the writing here is predictable and feels “prehistoric” by today’s standards. Later episodes, again, are more dynamic. Although there are occasionally some nice shots of wildlife in the show, Korg 70,000 BC's biggest deficit is that it looks to be filmed in contemporary and familiar Southern California, not a dangerous prehistoric landscape. 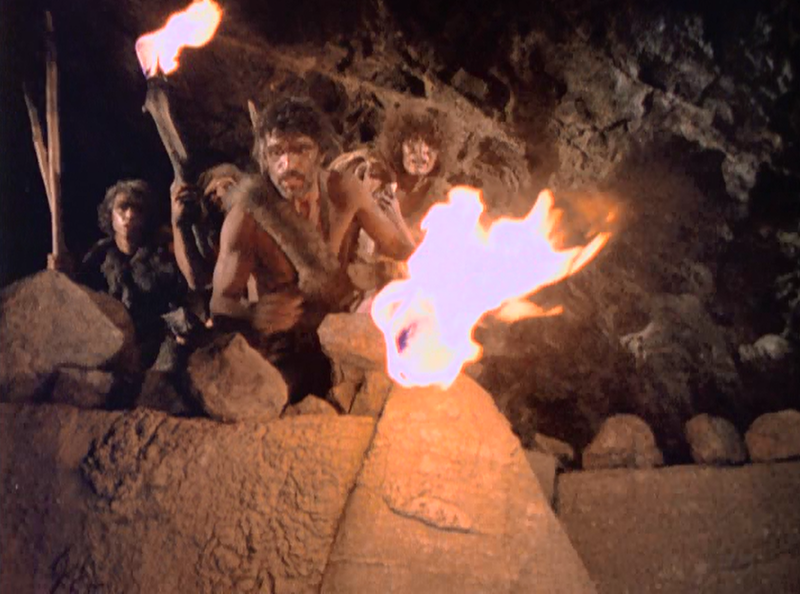 Some episodes (such as “The Running Fight”) are filmed at Vasquez Rocks, which at least looks vaguely prehistoric, though it is all-too familiar these days. 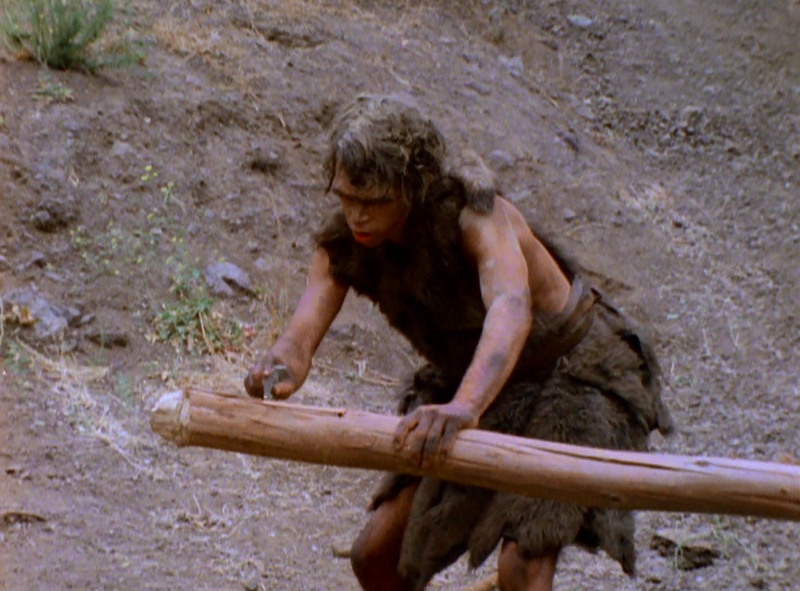 One strength of Korg: the caveman make-up holds up very well (at least as well as Worf's make-up on TNG.). You don’t ever get the sense you are looking at make-up or prosthetics here, just at real characters. As a kid I watched Korg religiously, though I was always disappointed that the cavemen didn't fight dinosaurs…which of course would be inaccurate. 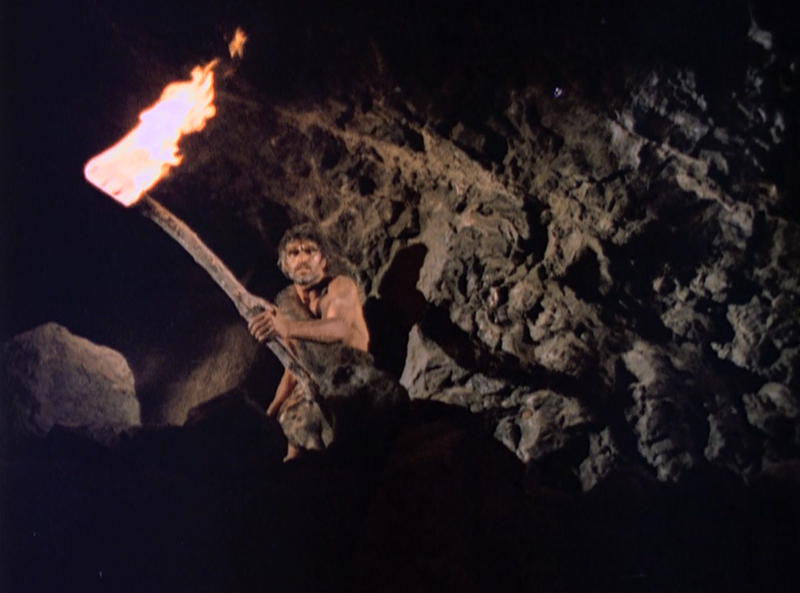 Still, that’s probably why I liked Land of the Lost better, even if Korg 70,000 BC took pains to present its material as accurately as possible for kid's television and for the state of learning about Neanderthals in the 1970s. 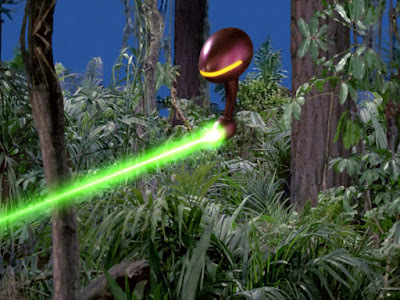 A very interesting, forward thinking experiment for children's television. Too bad it didn't work out. John excellent thoughts on Korg. We were so very fortunate to be children in the '70s. 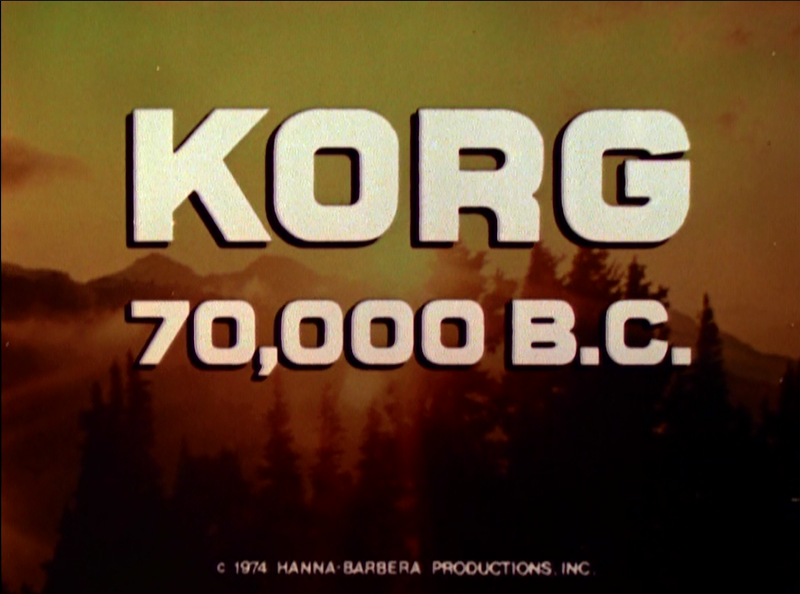 As a young boy on Saturday mornings in that fall 1974 to 1975 season we had KORG 70,000 B.C. , original LAND OF THE LOST and the animated VALLEY OF THE DINOSAURS series. I watched all three back then, albeit I liked Land Of The Lost the best. Kids love seeing dinosaurs. I wish you would include the episode with the commentary. I would love to watch one of these now. I totally missed this one growing up.